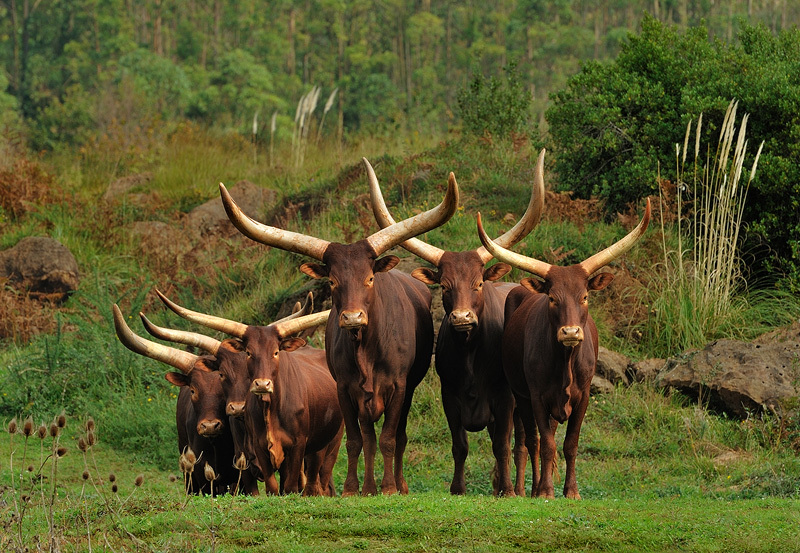 The very photogenic breed of cattle you see here are called Ankole-Watusi, native to Africa. Its large, distinctive horns, that can reach up to 2.4m (8 ft) from tip to tip, are used for defense and cooling by blood vessled honeycombes. Ankole-Watusis weigh from 410 to 730 kg (900 to 1,600 pounds). Ankoles are able to utilize poor quality forage and limited quantities of food and water. During the day, the calves sleep together, with an "auntie" cow nearby for protection. At night, the herd-members sleep together, with the calves in the center of the group for protection. The horns of the adults serve as formidable weapons against any intruders.